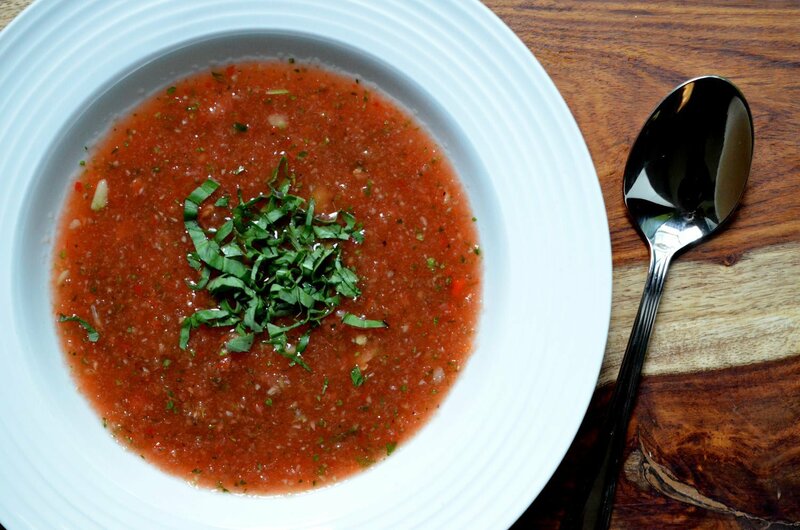 Gazpacho is a Spanish soup, usually with a tomato base, which is often served cold. This recipe puts a twist on that with a summer favourite – watermelon! It is nice and light and perfect as a starter for a summer meal (or even as a light lunch on a patio). Place watermelon in a food processor and pulse until liquid. Place liquid into a large bowl. Remove and large pieces not chopped up by the food processor and discard. Place remaining ingredients, reserving 1/2 cup of basil leaves for serving, in the food processor and repeat. If you wish for the soup to be a little chunkier, do not completely liquefy. Mix the liquid watermelon and vegetables together. Season with salt and pepper. To serve, ladel the soup into a bowl and top with a pinch of basil. This can be made ahead and refrigerated for 24 hours.